Thank you for honoring the life and legacy of Bishop Clark. Bishop Otis G. Clark was born on February 13, 1903, in Meridian, Oklahoma before Oklahoma even a state. At the time it was Indian Territory. At the age of eighteen, Clark was caught in the "1921 Tulsa Race Riot" in the Greenwood District of Tulsa, Oklahoma. At the time Greenwood was a mecca for African-Americans who owned their own successful businesses due to the oil boom. This riot was one of the worse race riots on American soil caused by jealously. As a young man fleeing for his life he hoboed on a train to California looking for his biological father and left Tulsa for many years. Clark was heavily involved with the original Azusa Street Mission members. The Azusa Street Revival began in 1906 and was led by William J. Seymour in Los Angeles, California. Before the Azusa Street Mission building was torn down, Clark was given the Power of Attorney by Bishop Driscoll over the Azusa Street Mission.Samuel M. Crouch of Los Angeles, California officially ordained Clark as a preacher - this took place at 33rd and Compton Street in Los Angeles. 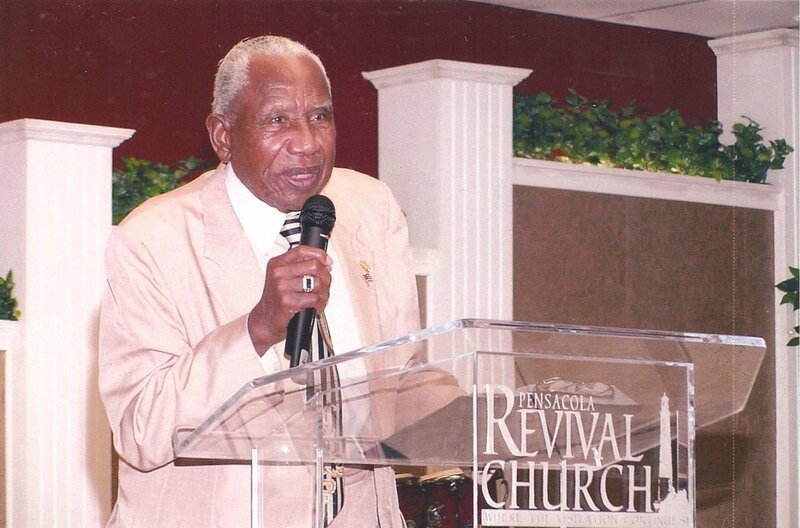 He also had the honor of serving Charles H. Mason, whom he affectionately called “Dad.” Bishop Mason is the founder of the Church of God in Christ. While living in California, Clark had the opportunity to rub shoulders with many famous actors. He knew a young man named Steppin’ Fetchit. Steppin’ Fetchit chose Clark to be a friend and buddy. Clark had the opportunity to serve Clark Gable, Joan Crawford and Charley Chaplin, some of America’s most prominent movie stars. Clark and his wife lived in Joan Crawford's home. He was the butler and she was the cook. The years of 1929-1932 represented dark and desperate days for America, known as The Great Depression. In the midst of the chaos of this time - God blessed Clark. During The Great Depression he was well provided for with ample food and clothing. Not once did he stand in a bread or soup line. To the glory of God, he served as an International Minister for over 90 years, longer than the average life expectancy. Clark's daughter and grand-daughter are carrying on the torch of revival and his Azusa Street Revival legacy. They continue to preach and write about the oracles of God. To read more about his life - order his biography, His Story, History, and His Secret. Evangelist Clark was older than the state of Oklahoma, which was incorporated in 1907. He is a 1921 Tulsa Race Riot Survivor. This took place on America’s Black Wall street, the Greenwood district of Tulsa, OK. He attended the second World's Fair in 1933 in Chicago, IL...and guess what they previewed?...The TELEVISION.